Check out the new Rapscallion, an OFF- looping blade with great control and generous sweet spot. If you're interested in designing your own blade, start by looking through the Materials pages to explore what type of veneer and core wood I have in inventory. I've added a For Sale page with some pre-made one-off, demo, and returned blades that are available for immediate sale. Keep an eye on a recent prototype blade being evaluated by some members of the MyTableTennis community at this link. Uniquely blending form and function, these heirloom-quality table tennis blades are designed and crafted for the discerning player. 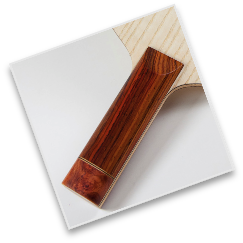 Each blade is individually handcrafted with meticulous care using quality domestic and exotic woods. The use of distinctive hardwoods make each handle unique. Choose one of my blade compositions or design your own based on my extensive inventory of veneer and core materials. Select a blade shape and handle type or contact me to design a custom shape for your blade. 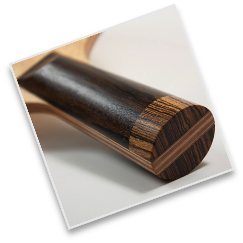 Browse the blade and handle galleries to see some options for handle wood. Contact me to discuss your requirements or any questions that you have. After finalizing all of the details, I'll send you a PayPal invoice and then start work on your blade. The final result is a totally unique blade that's perfectly matched to your style of play.